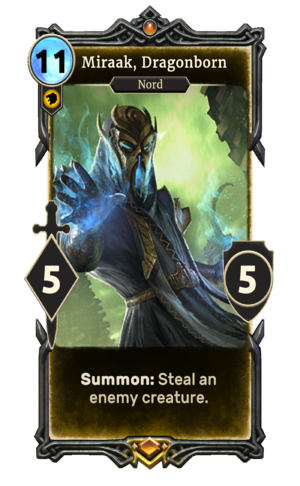 Miraak, Dragonborn is a unique legendary Willpower creature card. It is part of the Core Set. "You're not as powerful as you believe!" "You cannot hope to outrun destiny." "I shall tear your heart out, deceiver." "We reclaim what was stolen." This card's summon ability applies the GOL HAH DOV! card effect. These are the words of the Bend Will shout from Dragonborn. Miraak first appeared in Dragonborn. This page was last modified on 15 February 2019, at 00:26.